Has Putin Just Killed the Iran-Russia Air Defense Missile Deal? Vladimir Putin has frozen the transfer of S-300 surface-to-air missile systems to Iran, a Kuwait-based newspaper claims. Russian President Vladimir Putin has temporally halted the sale of S-300 surface-to-air missile systems to Tehran after receiving intelligence reports that Iran has supplied Hezbollah with advanced Russian missile systems, the Kuwait-based daily Al-Jarida claims. The newspaper bases its report on information supplied by a “highly reliable source” in the Kremlin “familiar” with Putin. The source claims that Putin suspended the sale based on information supplied by Israel that Iran has supplied Lebanon-based Islamist militant group Hezbollah with SA-22 (Pantsir-S1) air defense systems. Russian pilots flying over Lebanon and Syria purportedly confirmed the presence of the short to medium range surface-to-air and anti-aircraft artillery weapon system in Hezbollah-controlled territory in Lebanon. Russian anti-missile radar operators stationed in Syria were also allegedly able to corroborate Israeli claims. Israel also claims that Iran has transferred Russian-made Yakhont supersonic antis-ship cruise missiles to Hezbollah. Iran had purportedly pledged to Russia that it would not supply Hezbollah with Russian state-of-the-art weaponry in exchange for the S-300. Al-Jarida also claims that Russia has pressured Iran to withdraw its forces from Syria backing Syrian dictator Bashar Assad. As I reported previously, in June 2010, Moscow cancelled the delivery of the S-300 surface-to-air missile systems and stopped all military-technical cooperation with Tehran due to a United Nations Security Council resolution imposing sanctions — which included a ban on the sale of hi-tech weapons. In return, Iran demanded $4 billion in compensation from Moscow. Back in January 2015, both ministers (…) agreed to settle their differences once and for all regarding the sale of five S-300PMU-1/SA-20 Gargoyle SAM systems (40 launchers) to Iran for $800 million. The S-300PMU1 is a long range, Surface-to-Air Missile (SAM) system, “designed to engage aircraft, cruise missiles and theater ballistic missiles in intense clutter and jamming environment,” according to deagel.com. 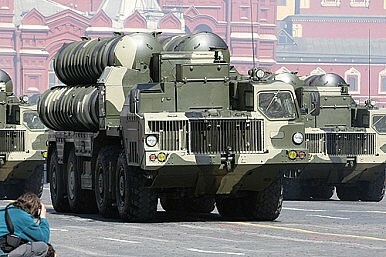 Russia has repeatedly declared that the S-300 air defense missile systems are exclusively defensive. “Under the so-called Joint Comprehensive Plan of Action (JCOP), an international agreement on the nuclear program of Iran signed in July 2015, the UN arms embargo will be lifted 5 years after the JCOP adoption day. However, conventional weapons sales can be decided on a case-by-case basis meanwhile,” I noted last month. How much Putin’s purported decision to postpone the S-300 sale will affect other aspects of Iran-Russia defense relations remains to be seen. Most of the current discussions over likely future defense deals between the two countries remain highly speculative and should be taken with a grain of salt. Moscow is making a strong effort to improve ties with Tehran.